This is the Northern part of KwaZulu-Natal. Dundee and Greytown are key towns of economic activities. This district lies between the N3 corridor and Durban. It is well known with rivers like Tugela, Mooi, Umvoti, Blood and Buffalo. Economically, this district is the fifth least contributor to the provincial GGP, standing at 2%. Statistically there are 456 455 people living in this district of which 35 625 are employed with a total labour force of 239 327. Agriculture is the biggest contributor to the district's economy as it contributes approximately 60% to the district economy. An area with moderate potential for agriculture in the form of commercial farming is in Endumeni and Umvoti south and north of the district. With its irrigation land around Dundee and Greytown are suitable for maize, soya and sunflower. There is also a potential for sugar cane and cattle in Umvoti hence Dundee has good potential for cattle farming. The main production or agricultural activities in this district are cattle, dairy, maize, vegetables & timber. Orange Grove Dairy is the biggest agri-business in the region. Their produced products are exported to the whole of KZN and produced wool is exported overseas and brought back as finished goods. -Battlefields are main attraction - Anglo Boer and Zulu wars, annual historic events and Talana Museum. Endumeni has a well developed tourism infrastructure with an extensive area of scenery beauty and a large number of heritage sites. Parts of Msinga have potential for adventure tourism. The district has great variety of accommodation establishment like bed & breakfast, small hotels and guest houses and also with most well established Isandlwana lodge. According to the district IDP, tourism sector is providing an increasing contribution to the local economies and the estimated contributions are Dundee 13.6%, Nqutu 12.7%, Msinga 11.1% and uMvoti 7.7%. Tourism industry has thus replaced mining and manufacturing as the most strategic sector of the economy. Manufacturing takes place mainly around Dundee & Greytown even though some of the firms/companies have closed down. The main products in the region or district are food products metals/ steel products, wood based products, clothing & leather goods. An area of Msinga has developed a small scale of manufacturing companies such as shoe and brick production industries. The district is situated in northern KwaZulu-Natal. It lies between the N3 corridor from Durban and Gauteng. 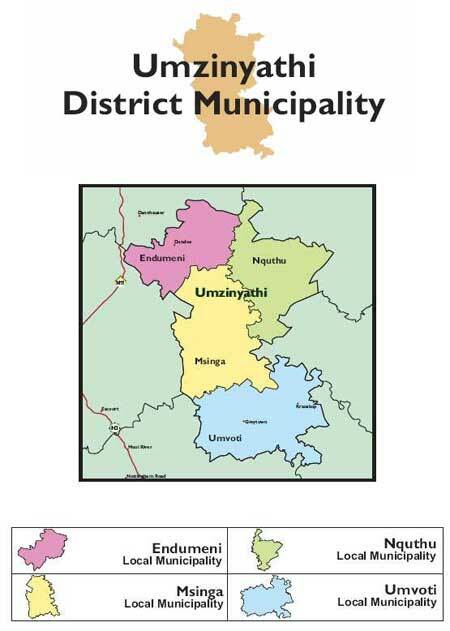 UMzinyathi comprises of four local municipalities namely, Endumeni, Nquthu, Msinga and Umvoti. The temperate climate, which only receives some frost in parts of the region in winter, allows for a range of agricultural activities. There are three main towns, Dundee which is the trade centre. Its main economic activities are retail, tourism and farming. Greytown is the agricultural centre of the district. UMsinga and Nquthu municipalities have rural-based subsistence economies with cultural heritage areas that attract some tourists but need to be substantially developed. 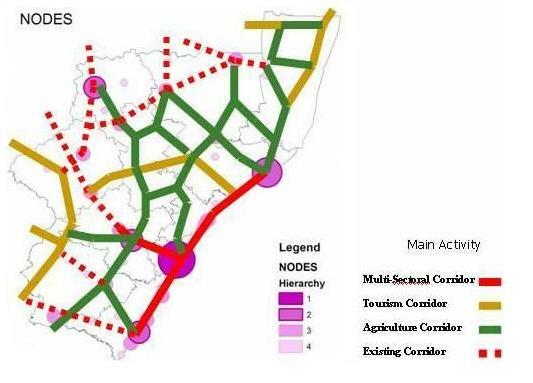 Nodes and Development Corridors for this region for the next five years. SC12 - Battlefields Route Corridor (Umzinyathi), focusing primarily on the route between Dundee and Greytown via Msinga, as a priority for the further development of the battlefields routes of the Province. Zulu heritage route: Develop cultural potential of Msinga, provide road links between Weenen, Msinga & Nkandla, improve R33. Finally, the Agrarian Revolution Strategy has clearly identified targeted Districts for 2006/7 which should each receive approximately R35m of Siyavuna funding . 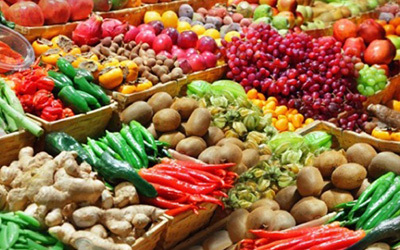 Each district will have specific targeted commodity focus areas that respond to the Provincial Agricultural Framework, areas of identified Hunger, and the priority areas identified by the Provincial Government and the Premier for 2006/7 specifically. The KwaZulu-Natal Province has both growing and maturing population, presenting opportunities and challenges to the province. According to Statistics South Africa mid-year estimates (2007), the KwaZulu-Natal population was estimated at an average size of 10,0 million people. The largest number of these people lived in eThekwini Metro (32.4% of the provincial population), followed by uThungulu district (10.2%) and Umgungundlovu (10.0%). 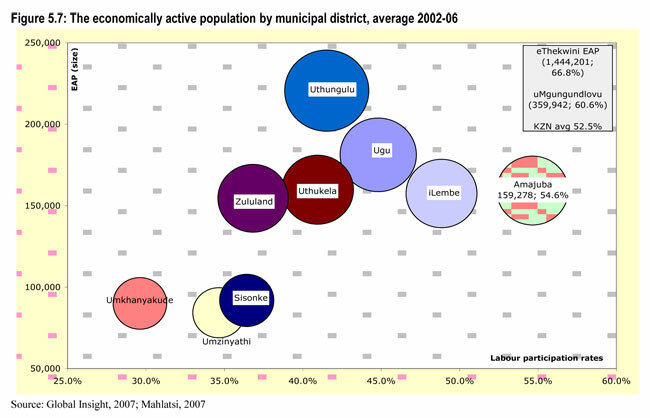 Umzinyathi was the sixth most populated district in the province, accounting for 6.4 percent of the provincial population (Figure 4.1). Figure 4.2 shows the distribution of the population across DMs by age group. The largest proportion of the population in Umzinyathi was the age group 15-64 years (53.5%) followed by age group 0-14 years (42.2%). The elderly population made the smallest portion of the total population (4.3%). More potential work seekers translate into higher unemployment levels, particularly if individuals are not appropriately skilled for available job opportunities. Hence, the higher number of both young individuals and people in the labour force overall will require more spending in education (primary and secondary) and skills development. 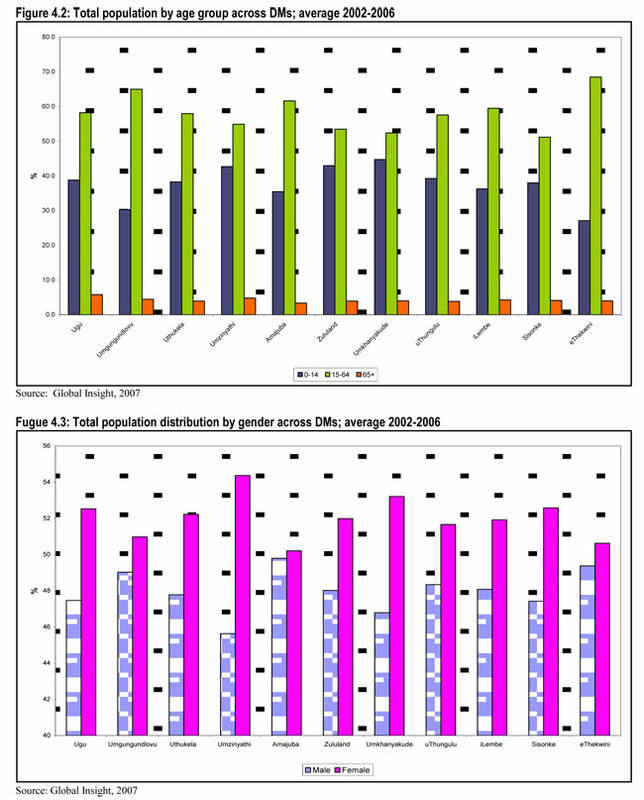 The majority of the population in Uthukela and across all DMs was female during this period (52%) (Figure 4.3). Between 2002 and 2006, uMzinyathi made the least contribution (0.8%) to the provincial GDP. The GDP-R for KwaZulu-Natal during this period was an annual average of R177,8bn. EThekwini contributed the highest proportion (64.6%) to the GDP-R, followed by uThungulu (9.5%), and uMgungundlovu (8.5%). The GDP-R for the province grew steadily from R163,9bn in 2002 to R194,7bn in 2006. 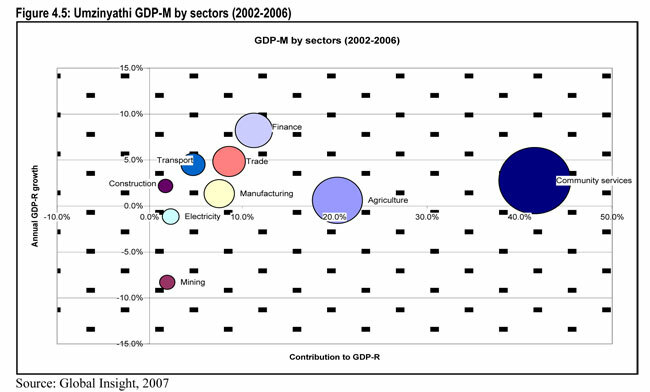 Fig 4.5 show’s uMzinyathi’s GDP-M by economic sector between 2002 and 2006. The district’s economy grew at an average rate of 2.6 percent during this period. The Finance, Trade and Transport sectors were the fastest growing sectors at 8.2 percent, 4.8 percent, and 4.5 percent respectively. The Mining and Electricity sectors shrunk on average between 2002 and 2006 with respective negative growth rates of -8.3 percent and -1.2 percent. The main economic drivers in the district were Community Services (41.6%), Agriculture (20.3%), and Finance (11.3%). 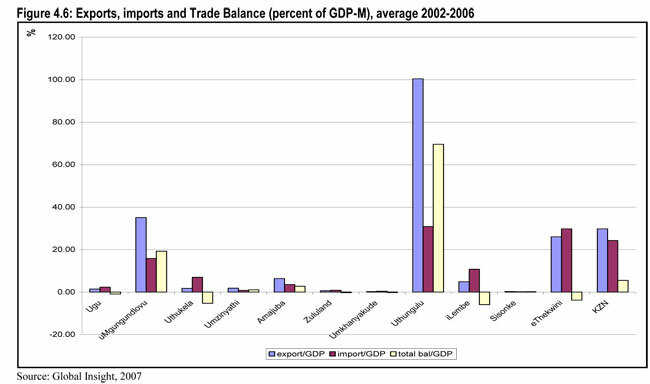 Figure 4.6 shows the percentage of export, import, and trade balance (as a proportion of GDP-M) across the districts. On average over the 5 year period between 2002 and 2006 Umzinyathi’s imports make up 0.8 percent of the province’s GDP, while its exports are 1.8 percent of the GDP-R, resulting in a positive trade balance of 1.0 percent. This district is one of the few in the province which achieved a positive average trade balance over the period under review. This could be a result of well-developed tourism infrastructure in this district, with great variety of accommodation facilities such as bed-and-breakfast (B&Bs), small hotels, and guest houses. Between 2002 and 2006, when the provincial labour force1 approximated 6,0 million people per annum (approximately 60.0 percent of total provincial population), the economically active population (EAP)2 was approximately 3,1 million. 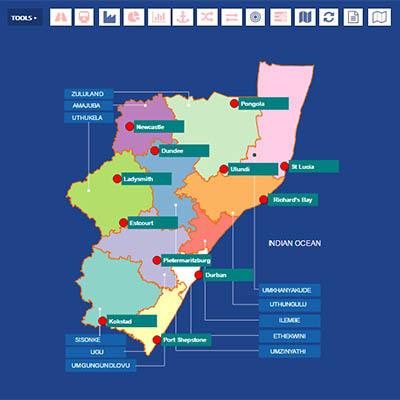 More than 1,4 million of the province’s EAP was found in eThekwini, followed by UMgungundlovu (360,000) and uThungulu (221,000). Umzinyathi’s EAP size was estimated at 84,000; this was the lowest in the province, and slightly less than that in uMkhanyakude and Sisonke (Figure 4.7). 1 Labour force is population aged 15-64 years. 2 The category EAP is made up of people who are either employed or unemployed. The employed consists of employers and employees, while unemployment are those not having a job but are actively seeking one (official definition), or they do not have a job, are actively seeking one or have given up searching yet still available for work at anytime (expanded definition). As a proportion of the district labour force3, however, the district’s EAP was estimated at 34.6 percent. At this rate, the district was the second most economically inactive after uMkhanyakude. During this period, there were about 59,000 unemployed people in the district; this was again the second lowest level of unemployment in the province. The district’s unemployment rate45 was, however, strikingly the highest in the province, at 72.1 percent; a disquieting 26.5 percentage points above the provincial average (Figure 4.9). As with the other districts, Umzinyathi’s unemployment rate was skewed towards the Blacks (75.1%). The respective rates for Coloureds, Indians and Whites were 43.7, 32.9 and 10.4 percent; all above provincial average (Figure 4.10), and above those in a majority of other districts. 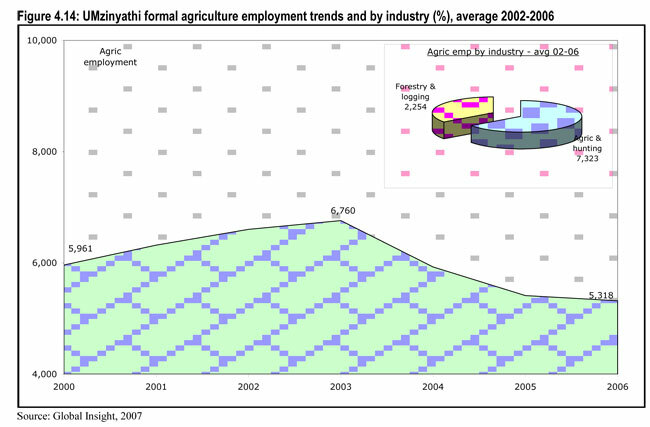 During the period under review, KwaZulu-Natal employment totaled an annual average of 2,1 million workers, and Umzinyathi’s employment level was the lowest in the province (Figure 4.11). The district’s formal employment was among the relatively higher levels at 71.7 percent of the total district employment (Figure 4.12). Community Services, Agriculture and Household Services were the most dominant sectors in the district’s formal employment, together accounting for about 79.7 percent of the district’s formal employment (Figure 4.13). Community Services, the leading employer in the district, was dominated by Education, followed by Health and Social Services, and then Public Administration & Defense Activities (Figure 4.13). 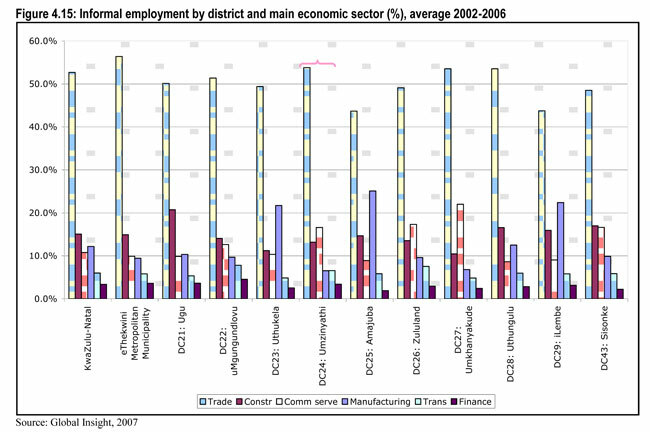 Similar to the other districts, Agriculture, the second highest employment provider in the district, experienced shrinkages between 2000 and 2006, after peaking in 2003. The main agricultural activities in the district were in the Agric & Hunting industry (Figure 4.14). 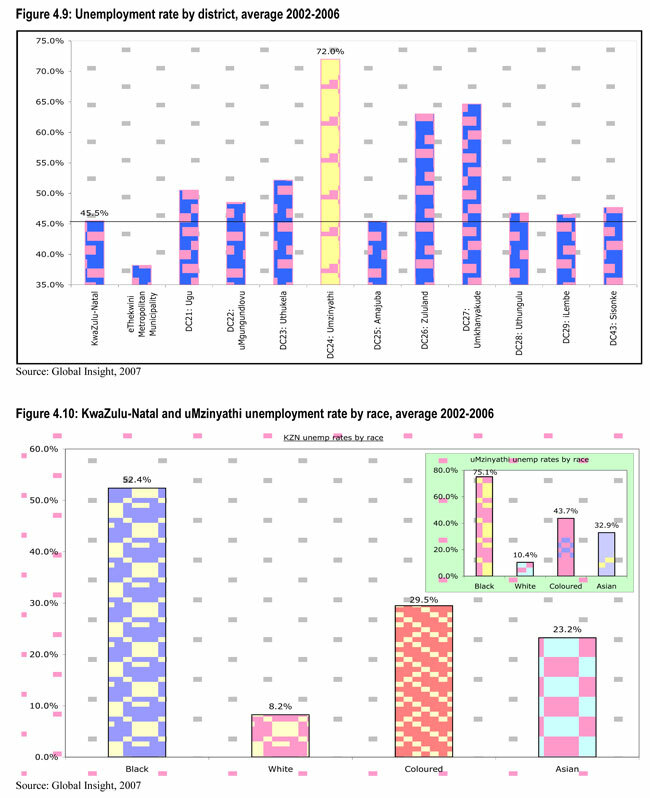 KwaZulu-Natal’s informal sector employment, recorded mainly in Trade, Construction, Community Services, Manufacturing, Transport and Finance6 sectors, was generally skewed towards the Trade sector. This was true in all but four districts, each having at least half the employment in this sector involved in trade of some kind; Umzinyathi was no exception. The second most important contributor to this district’s informal employment was ‘Community Services’ (Figure 4.15). As just discussed, formal employment in this sector was skewed towards Education, Health and Public Administration; the informal employment could probably have followed a similar pattern, and most probably Health and Social Work given the prevailing challenge of HIV and AIDS in the province, and a need for home-based care services. 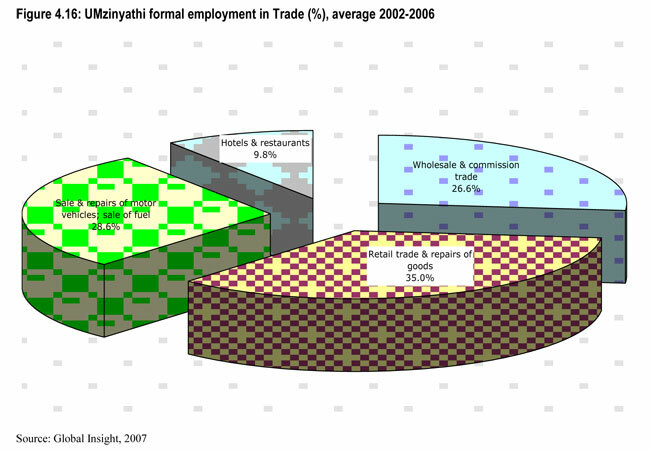 Figure 4.16 shows the distribution of uMzinyath’s formal employment in the Trade sector, the leading contributor to informal employment. The district’s formal employment in trade was inclined towards ‘Retail trade & repair of goods’ at nearly half the employment level. As assumed with ‘Manufacturing’, the informal trade employment could also have followed a similar trend with its formal counterpart. 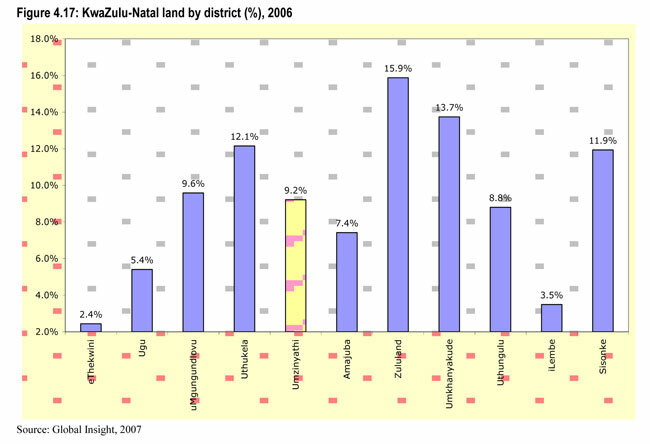 In 2006, uMzinyathi’s share of the KwaZulu-Natal soil was an estimated 9.2 percent, and the district was the fifth smallest in the province after eThekwini, iLembe, Ugu and Amajuba (Figure 4.17). Similar to a majority other districts, uMzinyathi had the largest portion of its land unavailable for agricultural purposes, with 36.6 percent of the land being unimproved grassland, and an additional 19.3 percent being thickets and bushland. 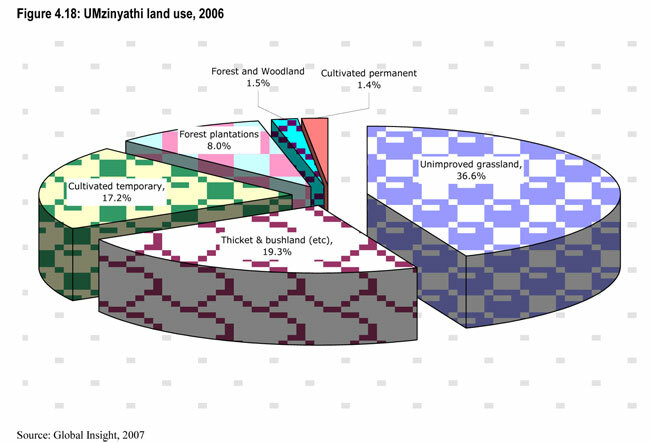 Permanent cultivation was carried out on just 11.7 percent of the land, and another 1.4 percent was used for temporarily cultivation (Figure 4.18). Between 2002 and 2006, there was a consistent decline in reported incidences of crime in the province (2.4 percent annual average). UMkhanyakude, and uThungulu to a less extent, was the only district resistant to declining crime rates. However, 2003 forward saw a comprehensive decline, though with differing magnitudes; the provincial collapse rate in crime incidents was 5.1 percent. 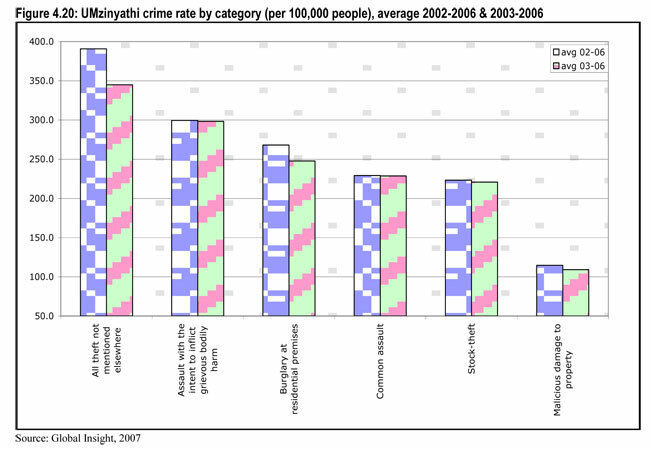 Umzinyathi enjoyed an annual decline of at least 6.0 percent per in crime rates (Figure 4.19). During the same period, 2002 to 2006, the most common crimes in this district were theft, assault and burglary. Similar to Sisonke, Uthukela and Amajuba, uMzinyathi had a unique experience of stock theft, and malicious damage to property. 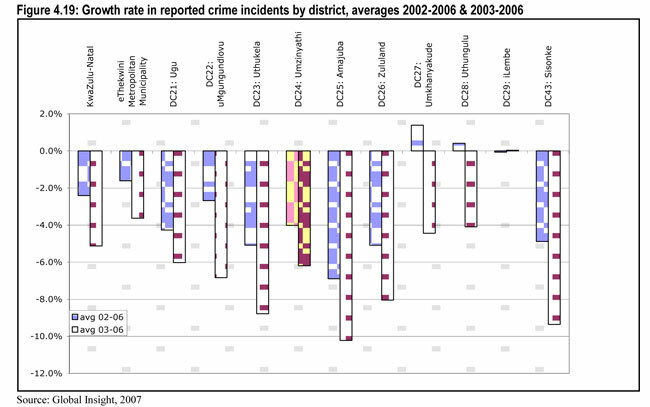 These crime categories were, however, not as pronounced in this district as they were in the other two districts. 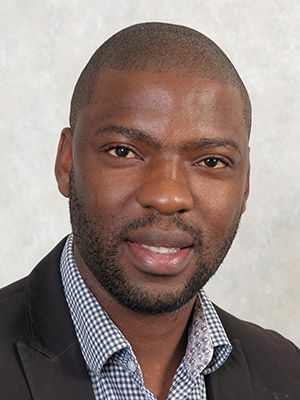 Furthermore, similar to Sisonke, uMzinyathi was comparably one of the safest areas in the province, with crime rates as low as 370 incidences per 100,000 people – half the rates in Amajuba, for example, whose average crime rate was fewer than 350 cases per annum between 2003 and 2006) (Figure 4.20). 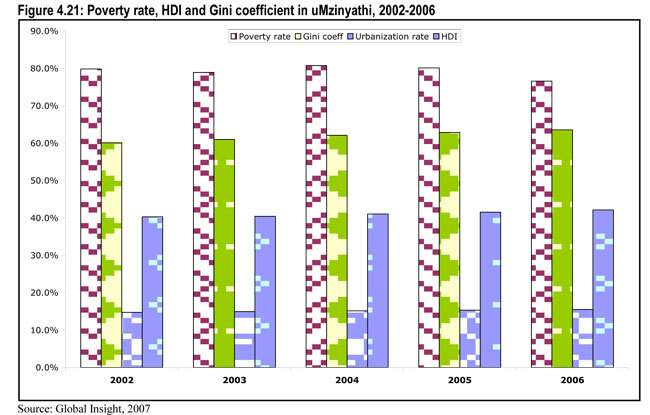 Figure 4.18 gives uMzinyathi district’s urbanisation and poverty rates, the Gini coefficient and the Human Development Index (HDI). It can be seen from this graph that, similar to what we have observed in all the other districts, the proportion of people living in poverty in the district has been on a decrease. However, in this district more than anywhere else, the rate of poverty itself was disturbingly high (79.9% in 2002 to 76.6% 2006). The district is dominantly rural, with only 14.8 percent of the households located in the urban areas in 2002, this rising to some 15.5 percent in 2006. As with the other districts, there is a disquietingly widening income gap in the districts (the Gini coefficient rose from 0.60 to 0.64). However, the overall human development in the district has improved, with the index increasing from 0.40 to 0.42. This is very low but could be expected owing to the outgoing discussion of the other development indicators. 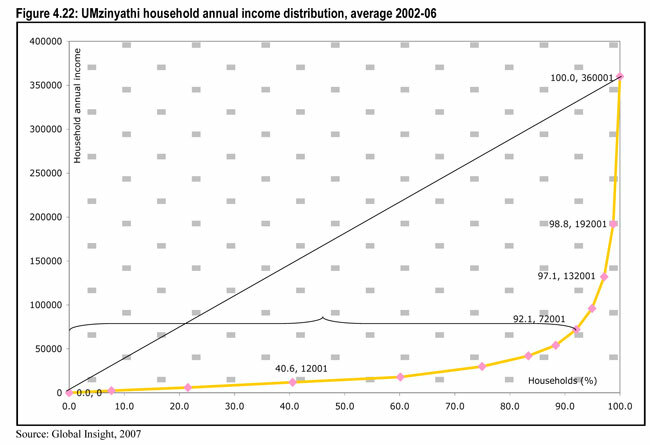 To confirm the wide income gap in the district – as captured by the Gini Coefficient, Figure 4.22 shows that in uMzinyathi, 92.1 percent of the district’s households fell in the R72,000 income group. 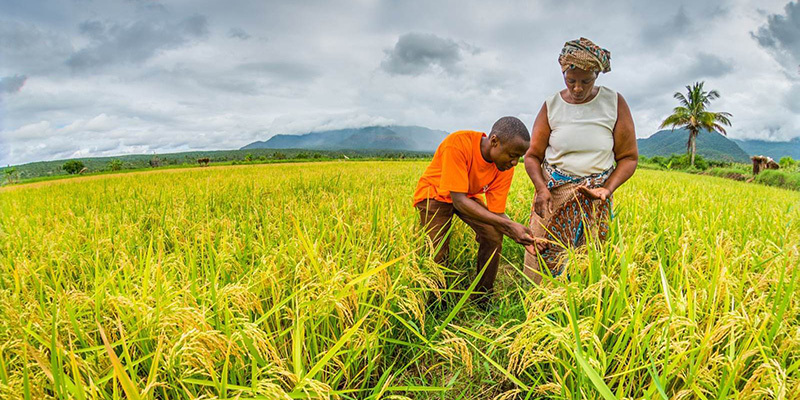 Despite the fact that KwaZulu-Natal covers such a small portion of South Africa's land area, a significant percentage of the country's small-scale farmers are based here. Agriculture in KwaZulu-Natal is extremely diverse and is reflected in the patterns of its topography. Most of the world's agricultural activities can be practised here. 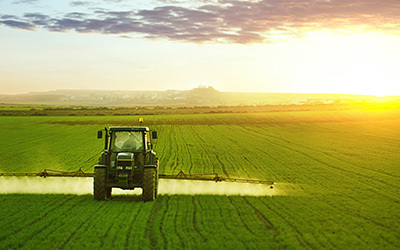 Due to the good reliable rainfall and fertile soils, the region's agricultural sector has become very productive, and is known for its specialist capability in several types of farming. The Province has a total of 6.5 million hectares of land for farming purposes of which 82% is suitable for extensive livestock production and 18% is arable land. There is tremendous potential for agricultural expansion in KwaZulu-Natal. It has been conservatively estimated that if the agricultural natural resources were optimally managed, the present production yield could be increased dramatically, thus unlocking the full agricultural production potential of KwaZulu-Natal. The social programs and the government/private sector joint projects that have been facilitated and implemented by the sugar industry bear testimony to the industry's conscious commitment to the socio-economic and welfare upliftment of its employees. The key challenge for the sugar cane industry remains the maintenance of competitiveness in relation to other world-class producers and industries.